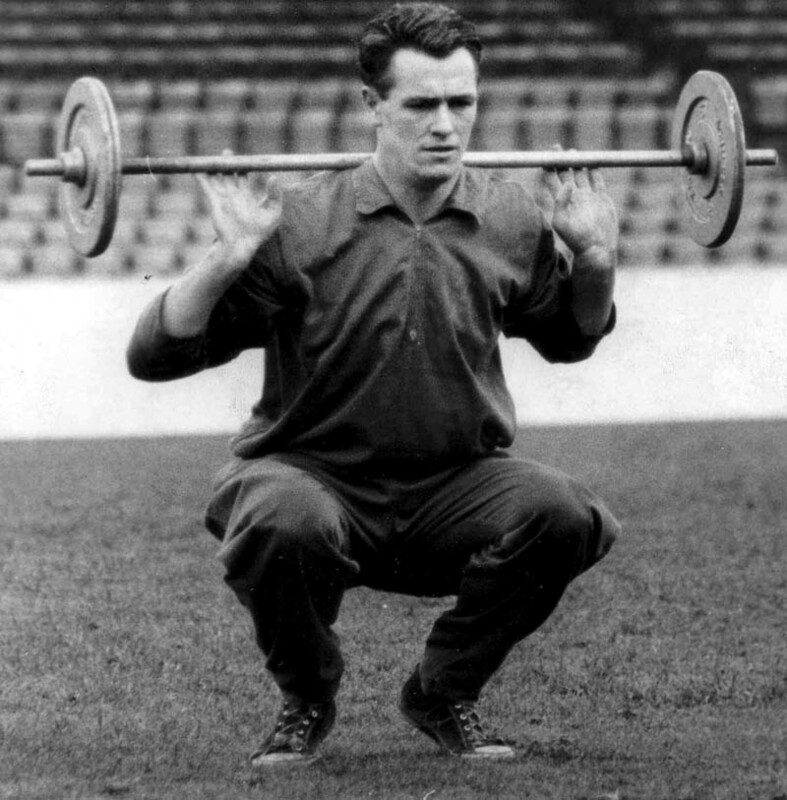 Building up his strength….Peter McParland. 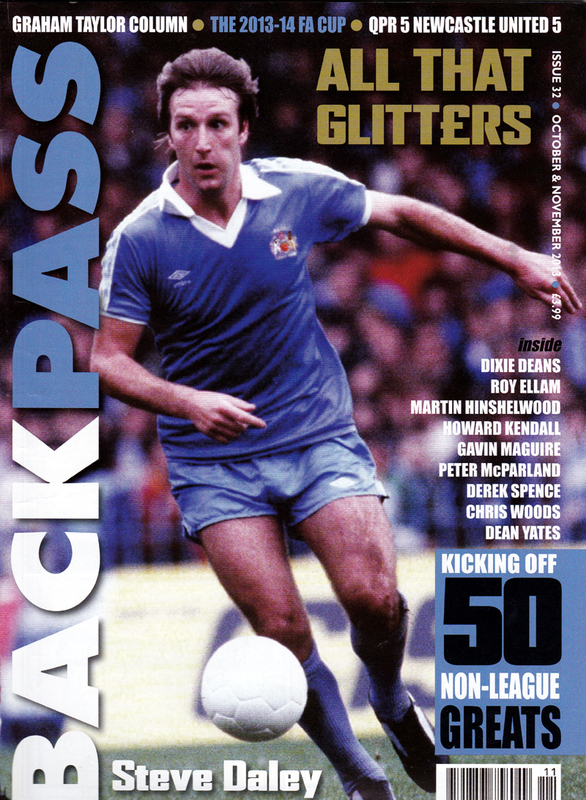 Peter McParland and Steve Daley are among the former Wolves players whose careers are given a full airing in the latest issue of Backpass. Those with an interest in all matters gold and black don’t have to wait long to read about the two men either – Daley is on the front cover and features in an article by Andy Gray (not that one!) on pages three, four and five while a double-page spread on McParland follows immediately afterwards. There is mention elsewhere of Steve Kindon as a Huddersfield player and Bob Hatton in his Blackpool guise but a colour photo of Mike Bailey on the front cover of Jimmy Hill’s Football Weekly shows the popular captain rightly clad in all gold. The skipper is also seen as a bystander in a photo of an early-1970s Wolves v Crystal Palace game, the sight of the famous clock on the old Molineux Street Stand proving as evocative as ever. Look hard enough and the magazine offers a glimpse of Billy Wright at a snowy Highbury as well. Elsewhere, the impact of Richie Barker and then John Barnwell on the life of young Notts County defender Dean Yates – a man who was in the Molineux press box recently on radio summariser duty – is outlined in an article by former Magpies player Dave McVay. Backpass is not all about past decades and Graham Taylor’s column focuses on the here and now in the form of the 2013-14 Premier League season, with a sideways glance at the three lower divisions in the process. We can also promise readers a humorous, lengthy Backpass feature with a strong Wolves flavour in the coming weeks. We know because we have just conducted the said interview. This magazine is widely acknowledged as the best of its kind. As a celebration of football nostalgia, it has no equals and has been warmly embraced by those inside and outside the game. Right player, wrong kit……Steve Daley in Manchester City colours. Sadly, so far this season, it has contained more Wolves-related entries than any of us would like to see in its excellent obituaries section and Ivan Ponting this time pens a moving tribute to Peter Broadbent. 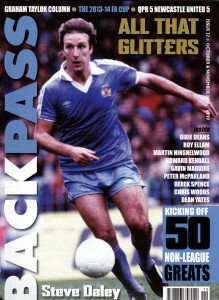 Please click on the icon to the right to discover where to buy copies of Backpass, including many of the previous 31 issues. Posted on: Thursday, November 14th, 2013.